I love when one LO conquers 2 challenges. I did this lovely page today for the Club CK 2/8 One Hour Challenge, use pink and make a Valentine project and Scrapbookers Anonymous Feb Challenge, use at least 3 hearts and stitching. Feeling pretty smart in tying these together. They were similar in theme. The pink doesn't look half bad for this either! Thanks for the fun ideas. Those photos are adorable!! I smiled just looking at them. Love your colours and your stitching. So glad you played along with us at Scrapbookers Anonymous! Love your stitching! Such a cute layout!! I love your stitched heart. What a cutie. Nice job on your layout! What a cutie! Lovely page! He's such a doll! His sweet smile just lights up his entire face. I can definitely see why you love his adorable grin so much. I think your pink really makes those pictures of him in the blue shirt really pop out. My eyes focus right onto his cute little face. How cute! Love the denim looking base paper and the way you did the title! 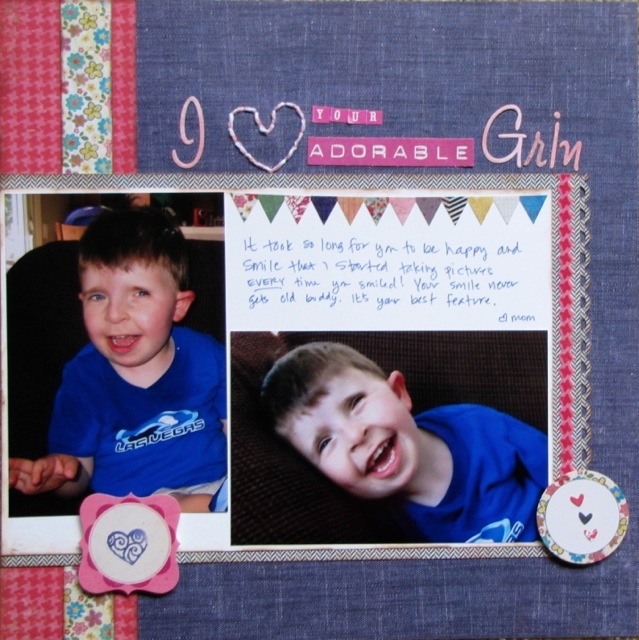 Thanks for joining in the fun at Scrapbookers Anonymous!!! Yes - you were pretty smart to tie them together. Loving your titling!! Lovely layout. Thanks so much for playing along with Scrapbookers Anonymous!! Really lovely page: the stitching is super!